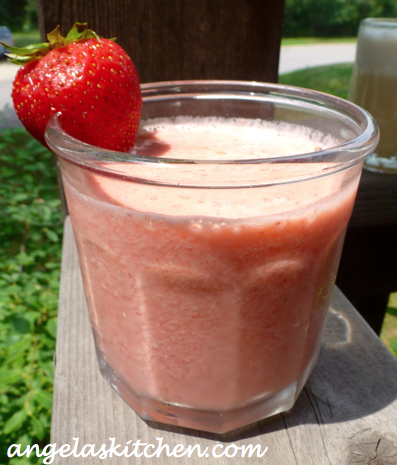 This summer whip up a homemade gluten free dairy free Strawberry Julius to beat the heat! It is time for Secret Recipe Club reveal day! Woo-hoo! What is the Secret Recipe Club? It’s a lot like Secret Santa, but with recipes. Each month you are assigned a blog. After selecting a recipe from that bloggers repertoire, you make and post it on reveal day. It is a great way to find fun recipes and blogs. I like how it gets me to actually sit down and go through another person’s blog. Blogs are a lot of work and take time to put together. Instead of skimming through just the new stuff (as is usually easier when we see a new blog) it is fun to really sit down and go through what else the blog has to offer. Fun stuff! This time my assignment was Amy of Amy’s Cooking Adventures. 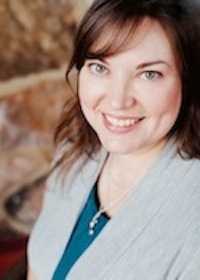 Amy’s says her cooking goal is “to make healthy, delicious meals that [the] whole family can enjoy and to expand their palates to make adventurous (or at least less picky) eaters.” Her blog totally reflects that! Our family had a hard time narrowing down what we wanted to make from her blog. Would it be something from the bacon party she threw for her husband (BACON! ), like the Bacon Caramel Corn? (Trust me, there was a HUGE pull for this recipe. I had to promise to make it for our chicken coop warming party.) Or should we make Chicago Style Stuffed Pizza, Pizza Pretzels (oh, you know we are making those for our lunchbox freezer cooking session, baby! ), Red Velvet Pancakes, Avocado Chicken Salad, Spicy Mini Meatloaves, not to mention the dessert section… But then hot weather hit. Not just hot weather, but really, really HOT weather. The type of heat where the local weather channel tries to amuse you by actually cooking eggs on the sidewalk. Yeah, that kind of hot. Bleh… All cooking went out the window (though that bacon caramel corn will be mine! Bwahahaha!) in favor of a frosty drink. We picked Homemade Strawberry Julius from Amy’s blog. I already have a Homemade Orange Julius on the blog, so we decided to whip up mall-style Orange Julius drinks to cool down and chill out. Are we glad we did! We can’t do the mall drinks (no dairy for us, baby!) but these are really close. Extra bonus for us is that they don’t have nearly the amount of sugar and other things in them that I don’t want to feed myself or my family as the ones from the mall. Yay! I adapted it a bit to use a dairy free milk substitute (almond milk or coconut milk from a carton are my picks in this) instead of the water for more creaminess and tweaked the ice amount and sugar a bit for our tastes. So there you have it, two yummy drinks to sip while sitting on the porch, bare feet propped up. We have more hot temps on the way this week and the kids are already clamoring for more Strawberry Julius. Thanks, Amy! We have a bunch of things marked from your site to make gluten and dairy free and your photos are wonderful. My daughters are trying to think of a good excuse to make a Pig Stye Cake (who needs an excuse with that cute of a cake)… LOL! It is just too adorable! 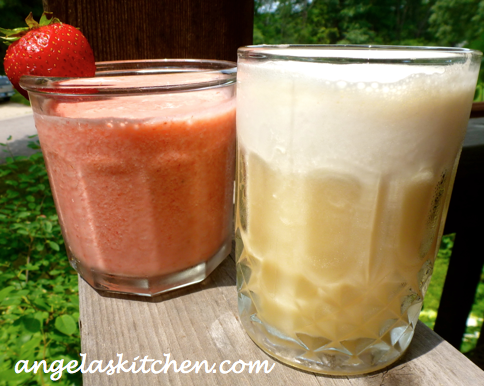 Homemade gluten & dairy free Strawberry Julius and Orange Julius. Who needs the mall? I'm so glad your family enjoyed the Strawberry Julius, Angela! I'd love to hear how some of the other recipes went with the dairy & gluten free modifications! I have several friends who are adopting dairy and/or gluten free lifestyles right now and I've told so many of them about your wonderful blog! Sounds like a great way to beat the heat, Angela! A perfect recipe for this heat! When I was younger, I was a real Orange Julius fan. Brings back good memories. I'll have to try to dairy free version. Thanks great choice! This looks delicious! I've never seen meringue powder though? I'll keep an eye out for it! that's an awesome summer drink - looks excellent. What a fun idea for a secret recipe adventure! That looks great. That looks SO good. I cannot wait to try making that myself. Thanks for sharing. Sounds like a perfect summer drink! 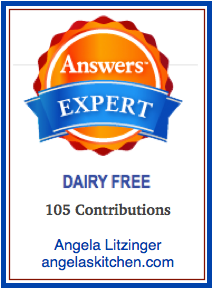 Love that you adapted the recipe to be dairy free! This is my first month participating in SRC and it's so great to check out other blogs and see what everyone else prepared!